Straightforward and reliable, Oeuf is a brand defined largely by the durable quality of its products. Oeuf has a reputation of successfully merging modern design, practicality as well as affordability, ensuring that you get the most out of their products for as long as possible. This designer is known for incorporating multiple functions in any one piece of baby furniture, whether it be crib, dresser or nursery cabinet. One of the most sought after lines from Oeuf is the Mattress products. With organic and hypoallergenic options, Oeuf, offers the highest in comfort with the best in quality in which to lay your baby's head. 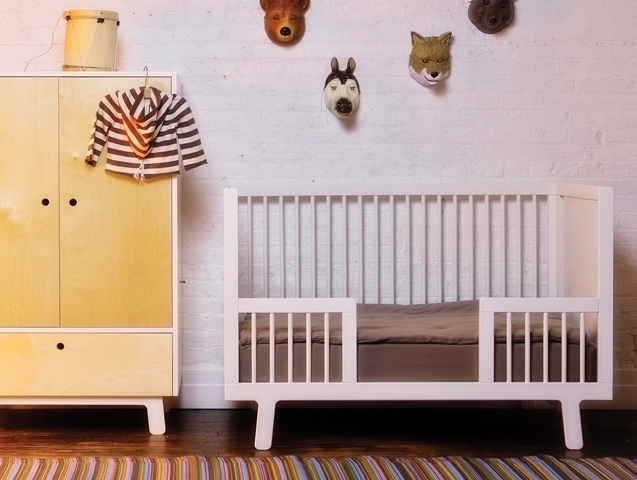 Babies don't stay small forever, and soon, the little crib in your nursery isn't going to be enough. Fortunately, the slow transition from a baby nursery into an older child's playroom doesn't necessarily mean a total makeover. One of the most important considerations to make is your child's sleeping place. Can the crib be converted to a toddler's bed, will the mattress be the right choice as your toddler grows into a little prince or princess? Will you need to get a new bed altogether for that sturdy toddler phase and will the mattress be the right choice for that big boy bed? When looking for a new mattress for your child, focus on things other than style and 'look'. For instance, decide whether you want one brand new and store-bought or slightly used. Lots of second hand baby stores can help you get a more affordable used mattress, however check to see what kind of chemicals were used to sanitize their products, as these might cause allergic reactions with your child. Also, safety standards for mattresses (and cribs) are constantly changing and being updated to ensure the utmost in health concerns are taken into account. 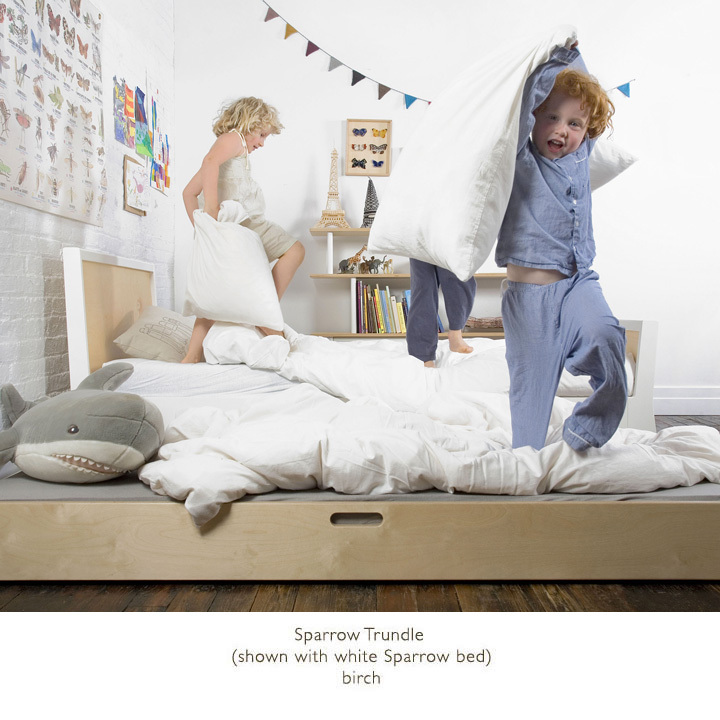 If you're looking for something hypoallergenic, one of your best bets is the Oeuf Sparrow Trundle Mattress. This is also great if you value lightweight qualities in your baby crib mattress. The trundle mattress is also made of medium density foam, which is good for moving around and compact size for that hideaway extra bed. If you need an extra mattress that can serve as a play area for your kids, (we know that they are all little monkey's at heart!) this is a good choice. It is made of non-allergenic materials, making it ideal for asthma-prone children. You might also want to check out the matching Oeuf Sparrow Trundle Bed for the ultimate in furniture that has design and practicality in mind. Buying a brand new mattress might cost a little more, but if you plan to keep a mattress through the years your child will use while they grow, then it's certainly a worthwhile investment. This Oeuf mattress line is worth a look. The Oeuf Pure & Simple Organic & Natural Crib Mattress provides a great transition from crib to bed. Although it was designed as a standard crib-sized mattress, it can also be used in the future as a bed mattress for a toddler or smaller bed. In addition, the mattress is made of organic materials, leaving you a little less to worry about chemicals riddle through the fabric. Also, the cover is made of 100% organic cotton to help air circulate freely throughout the mattress, giving your child a better night's sleep. Another good mattress worth a onceover is the Oeuf Pure & Simple Dual Firm Crib Mattress was designed to last your child through the growing years. In fact, longevity is one of its key qualities; the natural cotton batting helps reduce shearing forces on the fabric, and the mattress center is made of renewable and sustainable plant foam. This is very positive aspect, as choosing a mattress that your child can grow with helps you save on replacing worn out ones in the future. Also, it's essential to ask the manufacturers what's inside the mattresses, as some companies use different chemicals to clean out the interior before putting out their products out in store windows. When choosing a mattress, bring the child with you (if old enough) and ask him to sit on prospective mattresses. Ask whether he feels comfortable, or you might even do this yourself to get a more accurate assessment of the 'give' and firmness and whether this is comfortable for you or your child's taste. Another consideration to keep in mind is style. By the time children graduate from cribs to full scale beds, they will have grown enough to be able to choose their own designs. Ask your children to come with you to the score and pick out a mattress that he thinks will feel good in his room. Allow him this freedom, fosters independence and consequential decision making. Fortunately, Oeuf mattresses go well with any nursery or bedroom designs, as they provide a great amount of versatility in terms of style. Whether you have rooms leaning towards either the traditional or contemporary design, a mattress usually has no problems blending in!